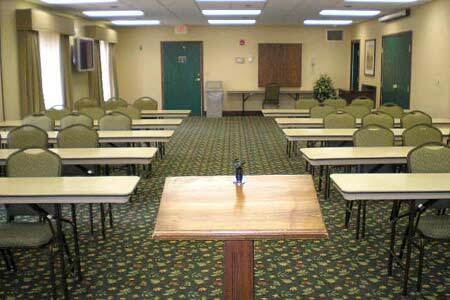 From family reunions and holiday parties to corporate training seminars, conferences and board meetings, the Country Inn & Suites, Charleston South, WV is the perfect choice for meetings and events in the Charleston area. Host a grand reception for up to 55 guests in the elegant 1,100-square-foot event space, or divide the main meeting room into two 550-square-foot rooms for smaller breakout sessions. Convenient amenities like free Wi-Fi, an LCD projector and a TV ensure your event is a success, and local catering options are also available if you'd like to offer your guests a snack or a full meal. For special corporate gatherings, ask our staff about our Executive Option meeting package that includes audiovisual equipment and a variety of catered treats and refreshments. For important board gatherings and meetings, take advantage of this all-inclusive meeting room package designed to take the headache out of planning.